Senior Hamas official Dr. Mahmoud Zahhar said that his movement has initiated a series of steps to develop its ties with the Islamic Republic of Iran. Hamas movement and Iran have taken special measures and we will see developments in these relations soon, Zahhar told Fars News Agency on Monday. Zahhar’s remarks came two days after Iranian Parliament Speaker Ali Larijani told Al-Mayadeen TV channel that Iran-Hamas relations have returned to its previous normal conditions. Zahhar considered Larijani’s statement on Hamas as expectable. 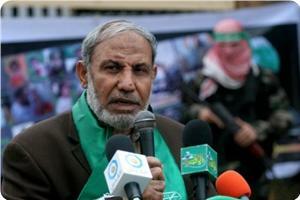 It has not surprised Hamas, he said. Commenting on Hamas's relations with Damascus and Hezbollah, Zahhar said that it is a complicated issue, stressing the importance of strengthening relations between Hamas and all Arab countries and parties. Concerning Hamas's relationship with Egypt especially after the Egyptian court's recent decision to ban its activities, he said that the movement did not take any position yet. In light of the Egyptian media incitement campaign against Hamas movement, there cannot be any effective contact between the two parties, he added. He denied stating that Egypt has lost its role in reconciliation file, clarifying that he said that banning Hamas activities in Egypt will negatively affect Palestinian reconciliation. Zahhar commented on western and Israeli media reports alleging that Israel had intercepted a shipload of Iranian mid-range missiles destined for the Gaza Strip, and said, "The main goal of this scenario is creating a rift between Iran and the Palestinian resistance movement and exerting excessive pressure on the Hamas movement". Israeli Navy claimed during a press conference that it intercepted an Iranian arms smuggling ship heading to Gaza in the Red Sea. Netanyahu angrily condemned Western nations as “hypocrites” for continuing nuclear negotiations with Iran, saying the ship proved Iran could never be trusted, and singling out EU foreign policy chief Catherine Ashton for shaking hands with Iranian officials. Iranian officials have dismissed the allegations, suggesting Israel orchestrated the whole thing as a chance to grandstand during last week’s AIPAC conference. The “evidence” of Iranian guilt is primarily secret, though Israel did publicize a picture of a bag of cement with the words “made in Iran” conspicuously written in English on it. Netanyahu saw the whole thing as such a fool-proof story it should’ve convinced everyone of his policy demands, but even some in the Israeli media were rolling their eyes at the “meaningless Hollywood-style propaganda” display. Prime Minister Benjamin Netanyahu speaks to the press at southern port of Eilat, Monday, March 10, 2014, as Israel displayed advanced M-302 rockets that were unloaded from the Panamanian-flagged Klos-C vessel. In Eilat, PM accuses world powers of fixating on the illusion of a changed Tehran, even in the face of ‘murderous’ ship cargo. 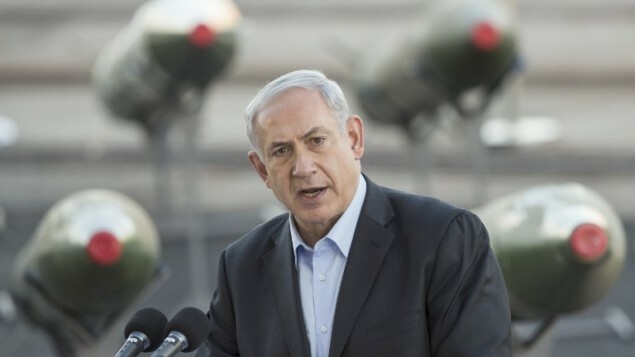 board the Klos-C last week, Prime Minister Benjamin Netanyahu harshly rebuked the international community Monday for clinging to what he said was the illusion of a changed Iran, even after an Israeli raid to intercept the ship uncovered the cache of advanced arms. Senior leader in Hamas movement Mushir al-Masri charged that Israel's claims on an Iranian weapons shipment to Gaza came to justify a new aggression on the besieged Strip. In an interview aired on Al Jazeera TV on Monday night, MP Masri said that Israeli authorities try to picture Gaza as a “terrorist den” in order to tighten the siege on it. Israeli occupation is trying to cover up its escalated crimes against the Palestinian people by criminalizing Gaza Strip and resistance, he added. He described the ongoing PA-Israeli negotiations as an attempt to implement Israel's policy of imposing fait accompli and coercive conditions on the Palestinian negotiation team. “If the ship, as they claim, was heading to the Gaza Strip, on which port it will dock? 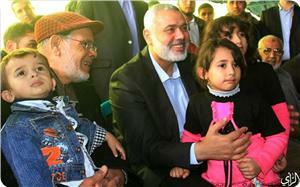 How can it reach Gaza in light of the tightened siege?”, he asked. Israeli navy claimed during a press conference on Monday evening that it intercepted an Iranian arms smuggling ship heading to Gaza in the Red Sea. Gaza premier Ismail Haneyya has asserted that the strategy of resistance against Israeli occupation would never be forsaken until end of occupation of the Palestinian lands. Haneyya, who was extending condolences to family of the martyr Ibrahim Al-Ghoul in Rafah afternoon Monday, said that Ghoul was a hero who worked in silence for the defense of Palestinian land and for the liberation of Jerusalem. Ghoul was killed while preparing an explosive device west of Rafah last Saturday while nine others were seriously wounded. Haneyya stressed that no negotiations, agreements, or bargaining would make our people forsake their right to historical Palestine from the Mediterranean Sea to the Jordan River. “The Al-Qassam Brigades in Gaza said it managed to develop its crude rockets and know many weak points of the Israeli military. The statement of the armed wing of Hamas came during the inauguration of the ‘Martyr Ibrahim al-Maqadmah’ square in northern Gaza strip, named after the Hamas leader. The monument was founded in dedication to Ibrahim al-Maqadmah, a political leader assassinated in March 2003 in an Israeli apache raid. It consists of the locally made M75 rocket which possesses a range of 75 kilometers and a historic Palestine map topping it. system proved that it can take the fight to the heart of Israel. The military brigades used M75 rockets during Hamas-billed Operation Stones of Baked Clay –Israeli-billed Pillar of Defense- to hit occupied Jerusalem and Tel Aviv. The “M” refers to the initial letter of Hamas leader Maqadmah and “75” to the rocket’s estimated range. 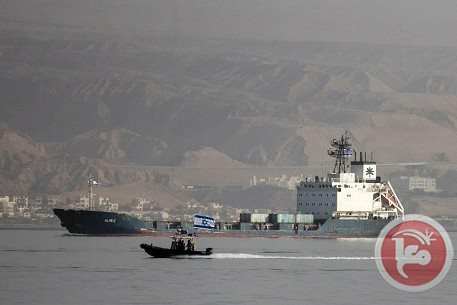 A ship allegedly carrying advanced rockets from Iran to Gaza that was intercepted by the Israeli navy was escorted into the Red Sea port of Eilat on Saturday. Israeli naval commandos seized the vessel on Wednesday in the Red Sea between Eritrea and Sudan, with the military saying it was carrying an Iranian shipment of M-302 rockets destined for the Hamas-run Gaza Strip. The Panamanian-flagged Klos-C was escorted into Eilat port by two Israeli warships. Thousands of Israelis gathered on a hill overlooking the port broke into applause when the ship came into view. "We will dismantle all the containers to verify if they contain other weapons," an army spokesman said, adding that a news conference will be held at the end of operations late on Monday. Israeli radio said that ambassadors and military attaches posted to Israel as well as "prominent Israeli figures" would be invited to view the weapons seized by the army. 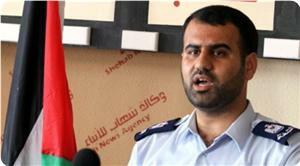 This, the radio said, "will prove to the world that Iran is providing weapons to terrorists active in the Gaza Strip." At the time of the vessel's capture on Wednesday, military spokesman Brigadier General Motti Almoz told army radio that dozens of the M-302 long-range missiles were on board. "From what we understand, it was carrying dozens of M-302 long-range missiles which can reach 150 to 200 kilometers (90-125 miles). It may be carrying other weapons as well, but we can only know this when it reaches Eilat. "There is clear and unequivocal information that this (shipment) came from Iran," Almoz said, without elaborating. Iranian Foreign Minister Mohammad Javad Zarif accused Israel of lying and noted that the announcement of its capture coincided with a speech by Israeli Prime Minister Benjamin Netanyahu at the AIPAC pro-Israeli lobby in the United States. "An Iranian ship carrying arms for Gaza. Captured just in time for annual AIPAC anti Iran campaign. Amazing Coincidence! Or same failed lies," Zarif wrote on Twitter on Thursday. Netanyahu has been pressing the international community to maintain crippling economic sanctions on Iran over its nuclear drive, and used last week's visit to the US to push his case. The United States said on Wednesday its intelligence services and military worked with Israel to track the ship. Israel said Sunday it had found 40 long-range rockets aboard a ship it intercepted in the Red Sea, charging that it carried weapons sent by Iran to Gaza Strip militants. It arrived late on Saturday and was inspected and unloaded on Sunday in an operation dubbed "Full Disclosure". A statement said security forces searching the Klos-C had found "40 rockets (type M-302), up to the range of 160 kilometers, 181 122mm mortar shells, approximately 400,000 7.62-caliber rounds". "Each one of these rockets poses a threat to the safety of the citizens of Israel -– each bullet and each rocket that was discovered had an Israeli address," army chief Lieutenant General Benny Gantz told sailors who took part in the operation. "Our efforts in preventing the proliferation of weapons and the supply of critical components with strategic influence over the region is not over," Gantz said. "There are many other missions ahead of us." Iran has flatly denied any involvement with the shipment, but Israeli Prime Minister Benjamin Netanyahu on Sunday accused the Islamic republic of "brazenly lying". Public radio said ambassadors and military attaches would also be there to see the equipment "to prove to the world that Iran sends military aid to terrorist groups active in the Gaza Strip". Netanyahu accused Tehran of "brazenly lying" over its involvement in the shipment, in remarks he said were directed at EU foreign policy chief Catherine Ashton who is in Iran. "I'd like to ask her if she asked her Iranian hosts about the delivery of weapons to the terror groups, and if she didn't, why not?" he said at the weekly cabinet meeting. "Nobody has the right to ignore the real, murderous actions of the regime in Tehran," he added. Ashton's visit, the first by a EU foreign affairs chief since 2008, comes after Iran signed a preliminary deal in November with world powers under which it agreed to curb its disputed nuclear activities in exchange for sanctions relief. The West and Israel have long suspected Iran of using its nuclear energy program as a cover for developing atomic weapons, a charge Iran denies. Iran's Foreign Minister Mohammad Javad Zarif on Friday rejected the Israeli allegation of Tehran's involvement in the weapons shipment. 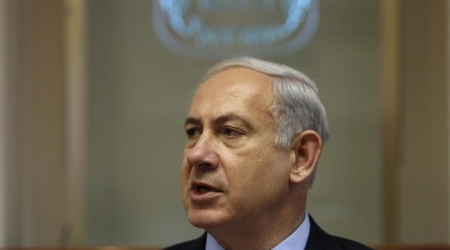 The ship's seizure coincided with a high-profile trip to the US by Netanyahu. "Netanyahu is in Washington ... and all of a sudden as a godsend, they capture a ship from Iran with missiles. Just a coincidence?" Zarif said in Jakarta, adding that "it is a lie". If fired from Gaza, rockets with a range of 160 kilometers could easily reach Israel's commercial capital Tel Aviv. 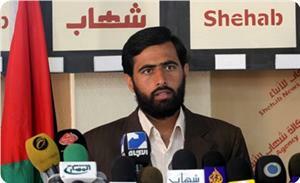 "We are going to prove that Iran organizes secret operations to arm terrorist groups in Gaza," he said. And Sudan, where Israel said the weapons were to be offloaded before being shipped overland to Gaza via Egypt's restive Sinai Peninsula, has also denied any involvement. 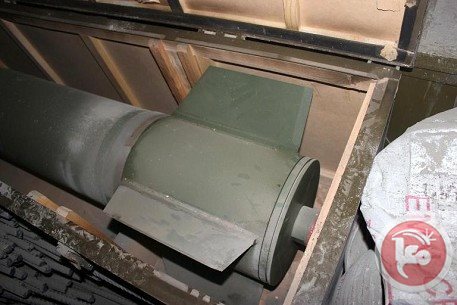 Al-Qassam Brigades, the armed wing of Hamas, denied any connection with the arms shipment that was allegedly seized by the Israeli navy in the Red Sea a few days ago. In a press release on Thursday, Al-Qassam Brigade said such Israeli claim is an attempt to rally international support for its blockade and repeated military attacks on the civilians in Gaza. "The enemy's claims that this ship was en route to Gaza are unfounded allegations. The Palestinian resistance has nothing to do with the ship which the occupation claimed to have captured," the Brigades stated. The Brigades, however, reiterated the right of the Palestinian people and their resistance to possess different weapons necessary to defend themselves against the Israeli occupation's ongoing aggression and crimes. Iran's foreign minister on Friday sharply rejected an Israeli allegation that Tehran tried to ship missiles to the Gaza Strip, calling it a "lie". Israel has said it captured a Gaza-bound ship Wednesday carrying dozens of Syrian-made rockets "capable of striking anywhere in Israel". The raid coincided with a high-profile US trip by Prime Minister Benjamin Netanyahu, who met with US President Barack Obama for discussions on a Middle East peace deal. "Netanyahu is in Washington ... and all of a sudden as a godsend, they capture a ship from Iran with missiles. Just a coincidence?" Iranian Foreign Minister Mohammad Javad Zarif said during an official visit to Jakarta. "If Netanyahu is a saint and can produce miracles I believe the Israelis themselves will be amused by that," he said. "So if you cannot believe in miracles by Netanyahu, the only thing that you can believe is that this is a lie. And it is a lie." The Israeli raid targeted a Panamanian-flagged ship in the Red Sea between Eritrea and Sudan. "For the arms to go through Sudan and from Sudan back to somewhere and from that somewhere to Gaza -- this is more like delusional thinking rather than even serious propaganda," he said. During a visit to Los Angeles on Thursday, Netanyahu compared Iran's leadership to Adolf Hitler. "He called then for the destruction of Israel and Iran today calls for the destruction of Israel," Netanyahu said. "We shall not allow Iran to arm itself with the capability to destroy us." Iran, Russia, China, France, Germany, Britain, and the United States met in Geneva on Wednesday for three days of negotiations on a decade-long dispute over Tehran’s nuclear energy program. The United States, other Western powers and Israel have long suspected Iran of using its civil nuclear energy program as a cover for developing atomic weapons, a charge denied by Tehran. Iran in recent talks agreed to roll back on its program in return for an easing of sanctions. Talks aimed at reaching a comprehensive and permanent deal are to begin in New York next month. Spokesman for the Palestinian interior ministry Islam Shahwan said that the Israeli occupation's claims about capturing Gaza-bound weapons aboard a cargo ship is aimed to justify its blockade on the Strip. In remarks on his facebook page on Wednesday, Shahwan said these Israeli claims came after some pro-Palestinian groups in Europe declared recently their intentions to attempt visiting Gaza by sea in an effort to break the blockade imposed on its population. The spokesman noted that the Gaza coast is under tight blockade by Israel and thus no ship can arrive without being intercepted by its navy, stressing that the Palestinian resistance is not stupid to bring arms by sea. 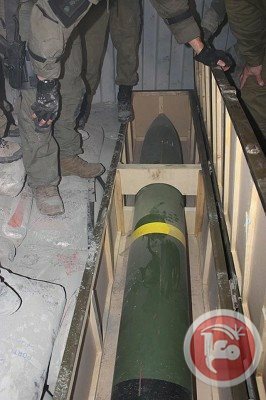 The Israeli naval forces claimed that a special unit raided a ship in the territorial waters of The Sudan in the Red Sea early Wednesday and seized a shipment of dozens of advanced rockets from Iran destined to the Palestinian resistance in Gaza. Israel claimed that it intercepted a ship in the Red Sea on Wednesday carrying Iranian "advanced weaponry" bound for Palestinian militants in Gaza, the military said. Gaza Ministry of Interior spokesman Islam Shahwan said in a statement that Israeli claims were a "dangerous move" to justify Israel's seven-year long blockade. Shahwan urged journalists to avoid "being tricked by the Israeli narrative about capturing a ship carrying weapons to Gaza," adding that "the sea is completely besieged and closed by the Israeli navy, and any ship which sails will be obstructed." The official, who spoke on the condition of anonymity, told Ma'an that he has "no clear data on the subject, but if the information is true it is a medal of honor to the one who sent the shipment." 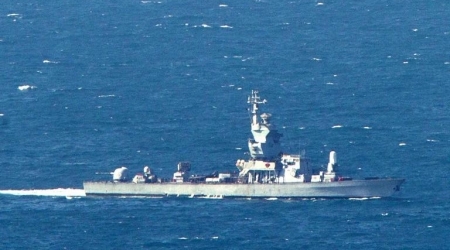 Israel, which has long accused Iran and Syria of providing military aid to Lebanon's Hezbollah and Palestinian militant groups, said the ship was carrying "advanced weaponry," including rockets "capable of striking anywhere in Israel." The military said the Syrian-made weapons aboard the "Klos-C" were shipped overland to Iran and then onward towards Gaza by sea before being intercepted between Sudan and Eritrea. "Dozens of surface-to-surface M302 Syrian-manufactured rockets were found (aboard)," Lieutenant Colonel Peter Lerner told reporters, adding that the crew of the ship had "fully cooperated." "We know for a fact the Iranians are behind this shipment," Lerner said. "We've been following this for several months." The military said in an earlier statement it had "prevented an attempt to smuggle an Iranian shipment of advanced weaponry intended for terrorist organizations operating in the Gaza Strip." The military spokesman's office tweeted that the rockets were "capable of striking anywhere in Israel." Israeli Prime Minister Benjamin Netanyahu said the operation proved that Iran was playing a double-game with the international community, conducting talks on its controversial nuclear program while supporting "terrorism." "This clandestine operation was conducted by Iran. While Iran is conducting these talks, smiling to the international community, it continues to arm terrorist groups, continues to perpetrate terrorism around the world," Netanyahu, who is currently in the United States, said in a video statement. 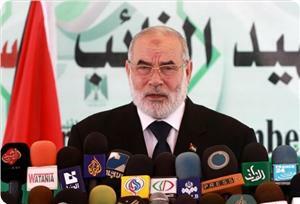 Once-powerful Hamas has alienated Tehran and Damascus by backing the Syrian rebels, and has fallen from grace in Egypt. Shortly after the IDF confirmed that it had seized a weapons-laden ship bound from Iran to Gaza on Tuesday night, a Hamas spokesman called it a "stupid joke," accusing Israel of lying in order to justify and expand its blockade on Gaza. Such a claim makes sense from Hamas' perspective, given that it was not the group for whom the weapons were destined, nor did it know about them. Not one of the multitudes of press briefings the IDF has given to the Israeli and international media since the ship was seized has specifically mentioned who in Gaza was expecting the missiles. (Then again, the IDF has not said that they were going to Hamas, either.) Defense Minister Moshe Ya'alon is the only Israeli official to even give as much as a hint about who was awaiting the delivery. "What has emerged from this operation is that there is a terrorist entity, an Iranian arm, that is funded, trained and armed by Iran," he said. In other words, the intended recipients of the missiles was Islamic Jihad, a terrorist group closely tied to Iran. Much has been written about Hamas' sorry state in the regional arena today. Its once solid relationship with the Syrian regime dissipated over the group's support for the rebels seeking to oust President Bashar Assad. Hezbollah and Iran, both allies of Assad, followed suit and turned their backs on Hamas, and Tehran cut its financial support. Tensions between Hamas and the new rulers in Egypt has been growing with each passing week. Just yesterday a Cairo outlawed the group in Egypt, branding it a terrorist organization. It is a far cry from the cozy relationship Hamas enjoyed with former Egyptian President Mohamed Morsi of the Muslim Brotherhood, Out of which Hamas grew. The route of the smuggled weapons - from Syria to Iran, and then supposedly to Sudan and overland through Egypt and the Sinai into Gaza - strengthens the assumption that Hamas would not have been the final address. It is unlikely that Damascus and Tehran would make any effort to strengthen Hamas, and it's hard to believe that Hamas, in its current weakened political situation, would risk the transfer of advanced rockets over Egyptian soil. Israel Wednesday allegedly intercepted a ship in the Red Sea carrying Iranian weaponry bound for Gaza, AFP reported. The Israeli military said the ship was carrying "advanced weaponry," including rockets "capable of striking anywhere in Israel." "The Syrian-made weapons aboard the "Klos-C" were shipped overland to Iran and then onward towards Gaza by sea before being intercepted between Sudan and Eritrea." AFP quoted the army as saying. It also came just over a week after the Jewish state reportedly bombarded Hezbollah positions inside Lebanon for the first time since the 2006 war, prompting a threat of retaliation. Israeli attacks against Gaza have been on the rise during the last three months, repeatedly violating the November 2012 cease-fire agreement between Gaza-governing Hamas Movement and Israel. Since late December 2013, eight civilian Palestinians have been killed, and about 80 injured, with six during January 2014, according to Ministry of Health in Gaza. Gaza has been under an economic Israeli blockade since 2007. The smuggling tunnels which Gazans were forced to rely on for their needs mainly of building material and fuels were semi-completely destroyed following Egyptian military’s disposition of president Morsi in July 2013. The Egyptian authorities open the Rafah crossing only for two loose days on a 10-day basis since July 2013. Ahmed Bahar, first deputy speaker of the Palestinian legislative council (PLC), said that the Palestinian resistance has never been a terrorist group because it defends its people and land against the Israeli occupation and its crimes. Bahar made his remarks during a parliamentary meeting held on Sunday inside a sit-in tent erected at the Rafah border crossing to protest eight years of tight blockade imposed on the population in Gaza. "Is the resistance that defends the justice of its cause terrorist? 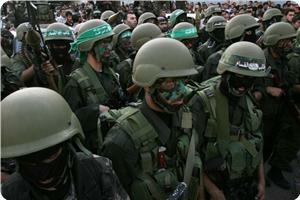 Is the resistance that is at the vanguard of defending the Arab and Islamic nations terrorist?" Bahar emphasized in his speech. The deputy speaker appealed to the Egyptian judiciary to respect the Palestinian people's resistance and the sacrifices they have made for their national cause, and stop making unreal accusations against it. However, the deputy speaker expressed his appreciation to the Egyptian authorities for giving Gaza pilgrims the opportunity to travel to the holy land in Makkah. He urged Egypt to open its Rafah border terminal every day before the movement of goods and individuals, especially for humanitarian cases. He also appealed to the UN to assume its legal and humanitarian role in ending the blockade imposed on Gaza, and expressed hope that its General Assembly and human rights council would convene to table the issue of the siege. 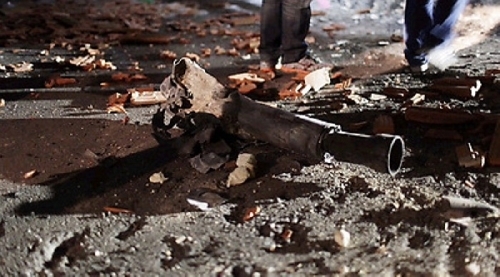 At least two rockets fired Sunday night from Gaza Strip and landed in Ashkelon Regional Council. WALLA Israeli website reported that two rockets were fired from the Strip and exploded in Ashkelon Regional Council. No injuries or damages were reported. Israeli sources reported, Friday, that Israeli Navy boats came under fire close to the Rafah shore, in the southern part of the Gaza Strip. Israel said the incident took place last Wednesday, after the navy opened fire at Palestinian fishing boats. The sources said that a gag order was lifted at midnight, on Thursday, and that the incident took place between Palestinian and Egyptian territorial waters. 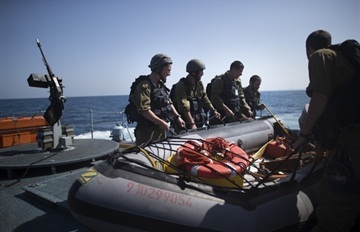 According to the Israeli report, Israeli Navy vessels observed two speeding boats driving, from the Egyptian side, towards Palestinian waters, and opened fire at them before Palestinian gunmen on the shore opened fire at the Israeli Navy vessels, causing no damage or injuries. Israel said that the navy is rarely under fire from Gaza, and that initial investigations indicate “smugglers” are behind the attempt.